I have these adorable Tooth Fair Kits available in my Etsy shop. These kits are crazy cute! 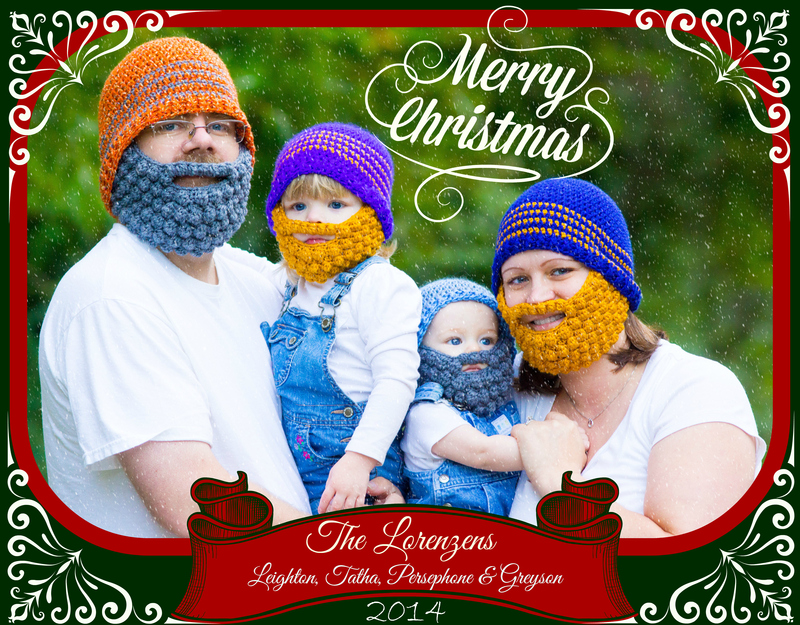 They include a 5-6″ hand crocheted “pillow” with a pocket on the back for the lost tooth/payment. It has four “roots” and is stuffed with poly fill. For crocheters, you can find the pattern here. I modified it slightly by using two strands of yarn instead of one, and crocheting an extra round on the underside once all four roots were added, before stuffing and closing up. Also available are Lost Tooth Charts, and Tooth Fairy receipts! Pictures of these don’t do them justice because they are printed on a medium card stock and coated in a fine, shimmering fairy dust! The chart and receipts are available in either blue or purple themes! See the Etsy listing Here! 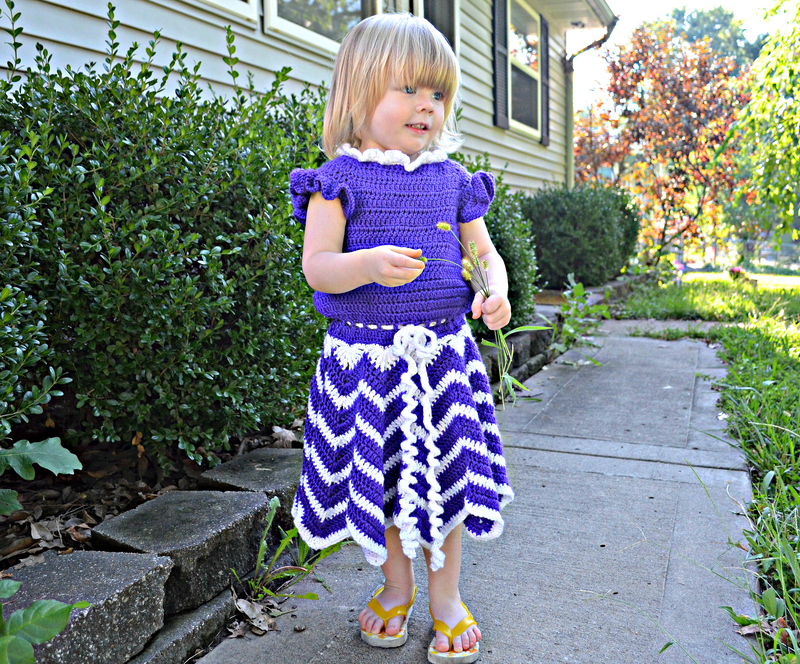 I’ve been meaning to make my daughter a dress for a while now. Clothing is not generally my favorite thing to make, maybe because I don’t like the added requirement of having to focus on my gauge. I can do it, I just don’t enjoy it so I don’t make much clothing from patterns, and I design even fewer – especially with regards to sizing. So when I made this dress I pretty much crocheted it free hand as I went and custom sized it by having her try it on at different stages. I worked it from the collar down in once piece with four increases at the front and back of the shoulders. Then I chained and skipped stitches for the arm holes and joined in the back so there was an opening for buttons. After this I continued working in rounds and eventually added a row of chain-2, skip-2, dc for a belt. I must not have tried the finished bodice on her before I started the skirt because it’s just a tad longer than I would like. The white colar at the neck is just shells, and the ruffles at the shoulder are just two rows of 2 double crochets in each stitch. For the skirt, I basically used a round ripple afghan pattern for the chevrons with a 3 dc decrease at the valleys instead of a skip-2 so there were only holes at the peaks. It worked well for an aesthetic way to increase each round for a full skirt. I was going to add a shell edging after the last white round, but it looked better when I got to it to just stop there. Then I worked a long chain for the belt. 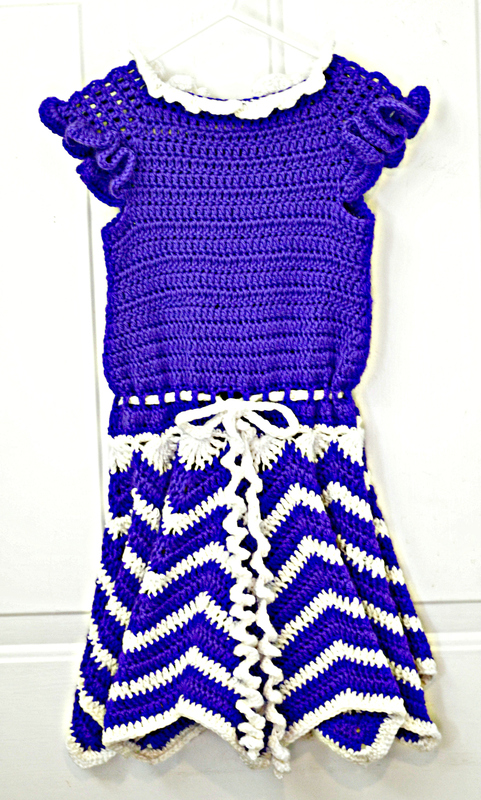 The center part is just single crochets for around the waist, but each end hanging down is a corkscrew curling ribbon. This is way simpler than it may look – just work 3 single crochets in each chain and it naturally curls. It’s not perfect, but it’s a starting point for making more dresses for her in the future. I probably won’t write this pattern out yet. Maybe after a few more iterations to work out the kinks. 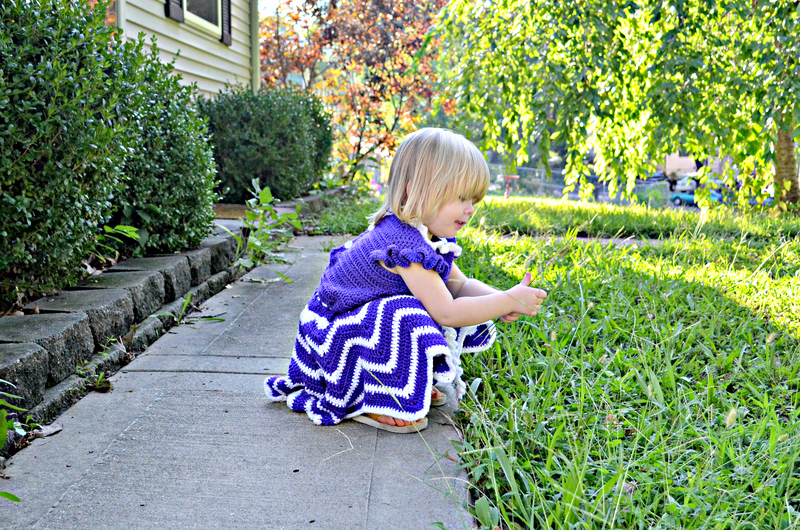 Anyway, she loves it because her favorite color is purple.